Where Macdonald’s double plateau template originated is unknown, but it’s likely from the British Isles, where the sandy wind swept soil often formed natural plateaus in green complexes. To make a long par 4 tougher, Macdonald often placed the double plateau green complex on his longest par 4’s. The holes are typically straight and often feature a Principal’s Nose bunker well in front of the green. A double plateau green has three distinct levels, each of the levels is able to serve as pin placement. Macdonald and Raynor would use bunkers to flank the plateaus, often placing them behind and on either sides of the green. A sketch of Lookout Mountain's double plateau green. The double plateau hole is generally one of the toughest on the course, requiring two great shots to have a chance at birdie. A good tee shot will leave a player with a difficult second shot, due to the tiered green and heavy bunkering. Since most double plateau holes are long par 4’s, players will need to avoid the Principal’s Nose bunker that guards the front of the green and hit a shot onto the correct tier of the green. The approach to the double plateau is all about distance control. If you can get the ball on the right tier it will leave a reasonable birdie chance, hit it the wrong number and a treacherous up and down or two-putt awaits. Due to the sharp dropoffs on the edges of the green, often the best place to miss a double plateau green is short of the green. The long par 4 11th at C.B. 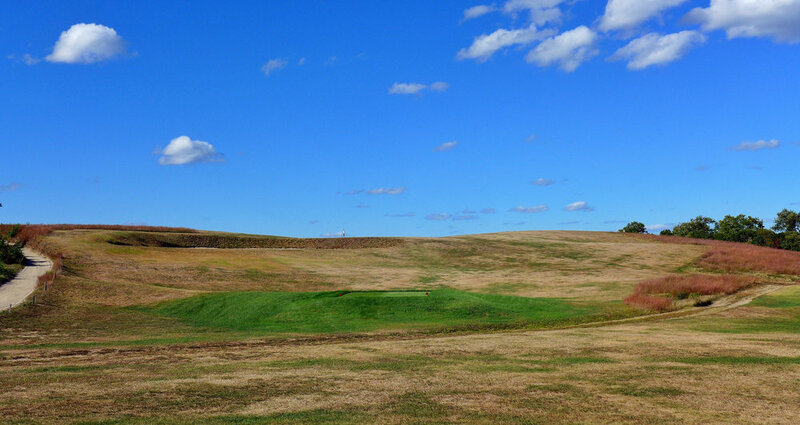 Macdonald’s masterpiece National Golf Links of America is a brilliant example of the double plateau green. A good drive will leave a player with a mid to long-iron approach over the road! From there, the first task is avoiding the deep Principal’s Nose bunker that protects the severely sloped green from a low running approach. The green is L-shaped and features three distinct tiers on the left, middle and right. At Chicago Golf, players first need to navigate a bunker that sits in the middle of the fairway off the tee. A good drive will leave a short-iron approach to the tiered green. A good shot is rewarded with a relatively flat birdie putt. Hit a poor shot and good luck getting up and down for par. The double plateau green at Chicago Golf. 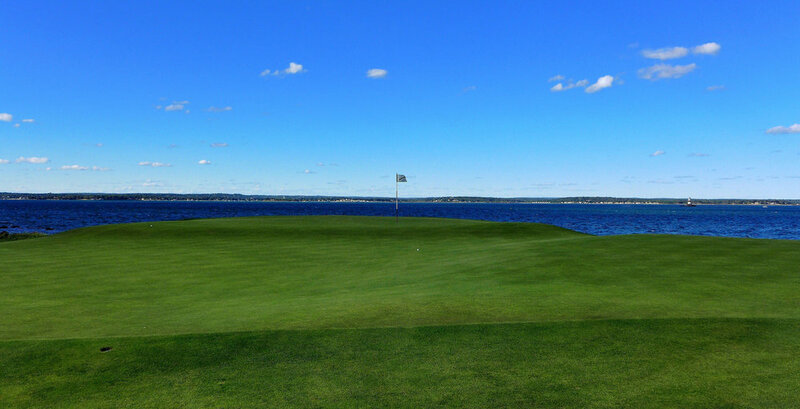 One of the most famous double plateau greens is at Seth Raynor’s famed Fishers Island, which is made extra difficult by the beautiful backdrop. Off the tee, a player is faced with a blind tee shot before a short approach to the tough green. The fairway bunker on the left is actually only one of two fairway bunkers on the coourse. The toughest pin is the back position to the infinity green as it looks like it is floating on the water. The green is guarded by a front bunker that makes a shot to the front left plateau difficult as well as a back bunker that can’t be seen from the approach. Just short of Fishers Island's 9th. The only Raynor design in Wisconsin, Blue Mound has one of the best double plateau greens in the world. Off the tee, a player is challenged with a semi-blind tee shot. After finding the fairway, a mid-iron is left to the dramatic double plateau complex. A back right position is the toughest on this green as each side is guarded by extremely deep bunkers. The approach to the tough 2nd at Blue Mound. A closer look at Blue Mound's double plateau. A look at the deep back left bunker at Blue Mound's 2nd. The C.B. Macdonald designed St. Louis Country Club has not one but two double plateau greens! The first of which is at the short par 4 6th, where a player faces a blind tee shot before facing a tough approach shot that requires a lot of precision. The green is guarded by deep bunkers in front, and the three tier green is one of the boldest double plateau’s ever designed. The second double plateau at St. Louis C.C. is the short par 5 15th, where a good tee shot will give long hitters a run at the green in two. 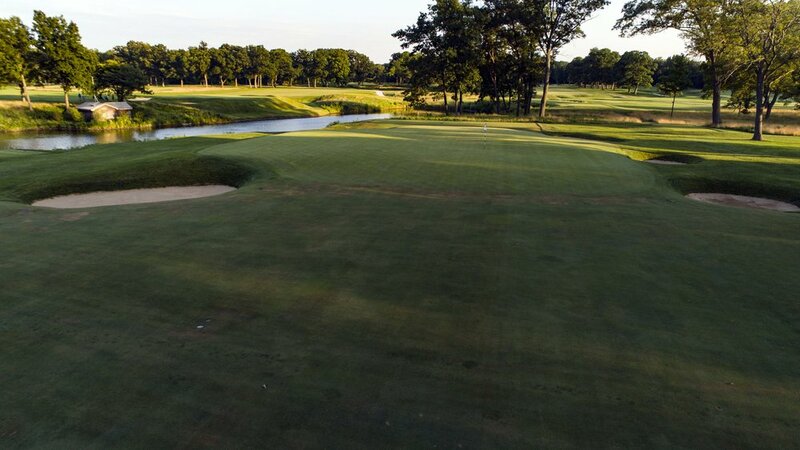 The green is a massive one, measuring over 10,000 square feet and has plenty of twists and turns making a long putt difficult to get down in two. The green is protected by bunkers on all corners, a likely destination for a player’s second shot. The short par 5 15th calls for a long-iron or fairway wood approach to the double plateau green complex. The front and back pin positions prove particularly difficult at SLCC's 15th. A look at St. Louis C.C. 's Double Plateau 15th. From the new back tee box at Shoreacres 7th, the original shot values are restored at Seth Raynor’s Shoreacres. A great tee shot will still leave a long hitter with a long-iron, hybrid or fairway wood shot into the challenging green. While the green is large, it’s guarded by bunkers on each side and in back of the green, the toughest pin location being in the back. The 7th tee shot at Shoreacres. Raynor’s brilliant Florida design at Mountain Lake opens with a bang as Raynor employed the double plateau green complex. Long hitters have to avoid the fairway bunker off the tee which sets up a short iron approach shot to the segmented green. The green's orientation is such that the front right side of the green is best approached from the right side of the fairway. The front left portion, is best approached from the right side and the back portion can be approached from either side. 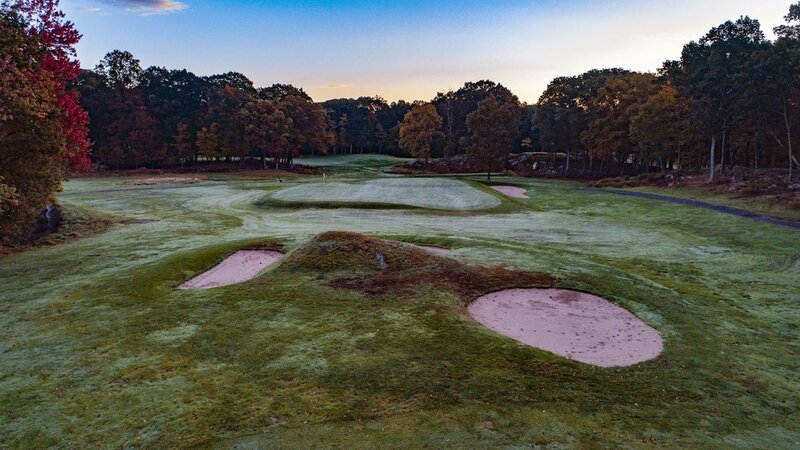 At Raynor's North Jersey design, the 4th hole is a great example of how Macdonald and Raynor liked to layout their plateau hole. Starting with a blind uphill tee shot, the 4th hole requires a tee shot in the fairway in order to control the spin of your approach shot. The double plateau green features a severe false front that repels any shots that are a little short, while the back bunker catches any over zealous approaches. The 17th at the restored Raynor, Lookout Mountain features a wide driving area before ramping up the difficulty on the approach. At 410 yards, a good drive will leave a player with a short to mid-iron into the tiered green. The tee shot at Lookout Mountain's 17th. The double plateau green at Lookout Mountain. From the right side of the 17th green at Lookout Mountain. Another long par 4, the 17th at Seth Raynor’s Yale design makes for a difficult finish. The first challenge is the blind tee shot, where a good shot will leave a downhill mid-iron approach to the tough green complex. Yale’s 17th has a distinct Principal’s Nose bunker. The hole is named after the “Nose” that sits about 50 yards short off the green. From there, the approach shot can be played to either the front right, front left or back right plateaus of this green complex. The approach which is obstructed by Raynor's principal's nose bunker at 17. The lengthy double plateau par 4 opener makes for a tough start at Raynor’s Yeamans Hall. After a good tee shot, players are faced with a mid-iron approach to a bold double plateau green. Yeamans Hall’s double plateau has some of the sharpest undulations of any in the world. The bold double plateau opener at Yeamans Hall. The look from the back of Yeamans Hall's 1st green. The par 5 12th at Macdonald’s Sleepy Hollow is a dogleg left par 5 that gives the long hitters a go at the challenging double plateau green in two. The green is a subtle L-shape and has a deep bunker that guards the inside of the L (right side). 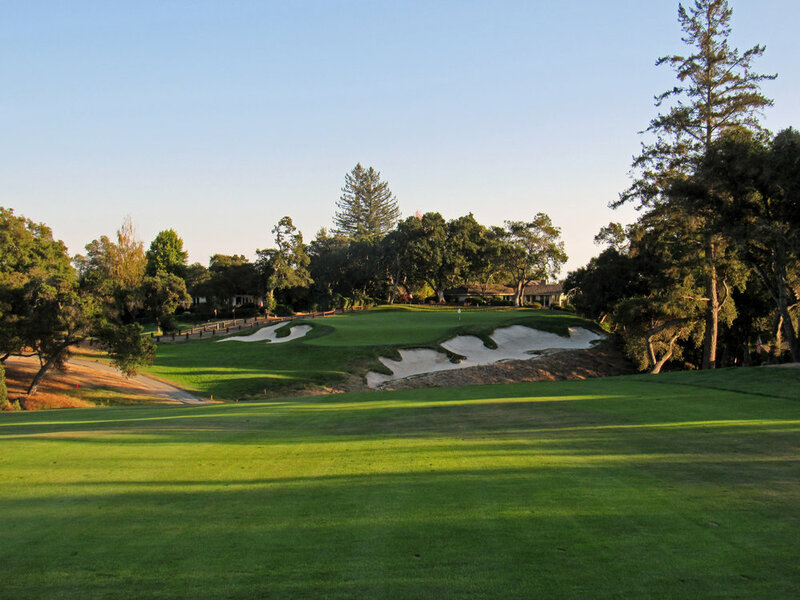 The oft-overlooked Seth Raynor design features a semi-blind tee shot that crests a hill. Once over the hill, the grand double plateau green complex is revealed. The front right and back right plateaus are guarded by a bunker. The front portion accepts a low running shot and a shot a little left will feed in. The front left side is propped up with the land's natural slope and is best approached from the right side of the fairway. At the public access Pasatiempo, we get to see Alistair Mackenzie’s take on the double plateau green. Like many of Macdonald and Raynor’s double plateau holes, the tee shot is blind one. A good tee shot will leave a short-iron approach to the severely sloped back to front green complex. Unlike Macdonald and Raynor, this double plateau isn’t an L-shaped complex, but rather, a long and narrow one. The slopes in this green make it important for players to control their spin in order to stay on the correct tier and have a good birdie opportunity.